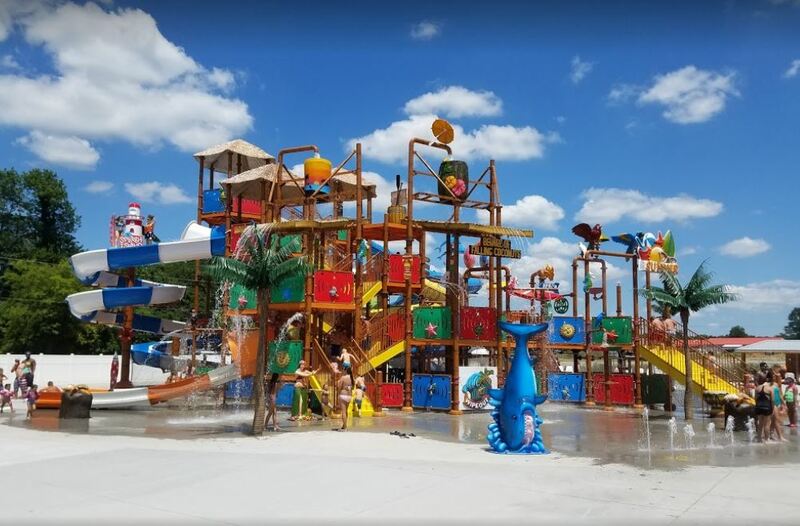 A supersized slide house that’s five levels high with 3 tunnel body slides, a multilane slide, a crazy cruise slide, 2 flushing buckets, and numerous water interactives! Great fun for the whole family. Height requirement for slides range from 36” to 40”. 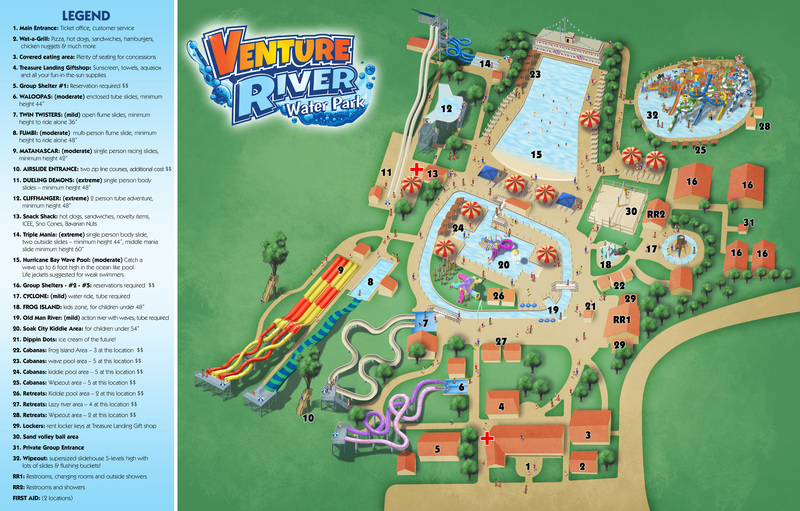 Giant continuous river inner tube slides allow guests of all ages to enjoy single and double riding through the totally enclosed tunnels. You must be 44″ tall to ride the WALOOPAS. 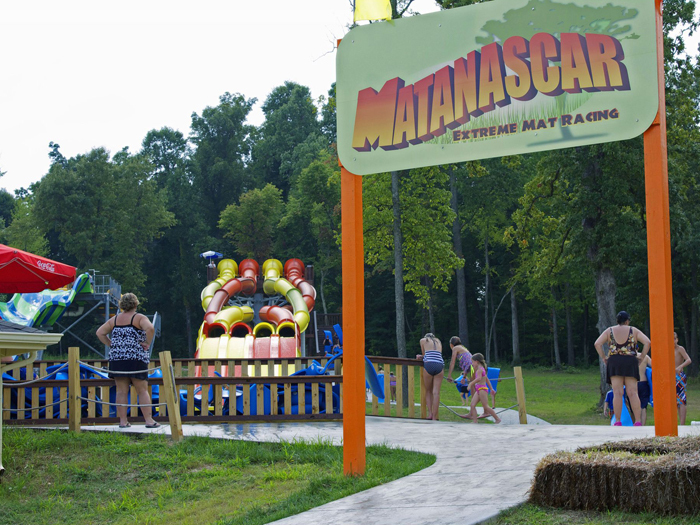 Matanascar is a four lane, head first, mat racing slide that accelerates riders through enclosed twisting tunnels. Riders speed over the double humps before crossing the finish line. You must be 42″ tall to ride the Matanascar. 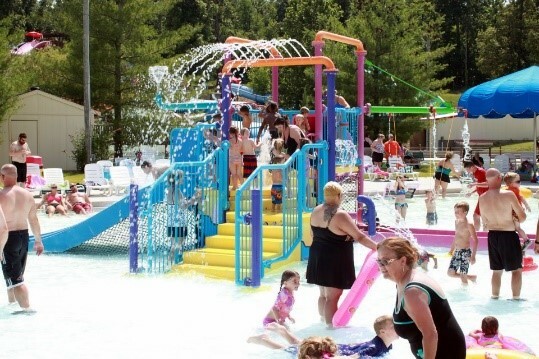 Catch a wave in our 18,000 square foot Wave Pool! 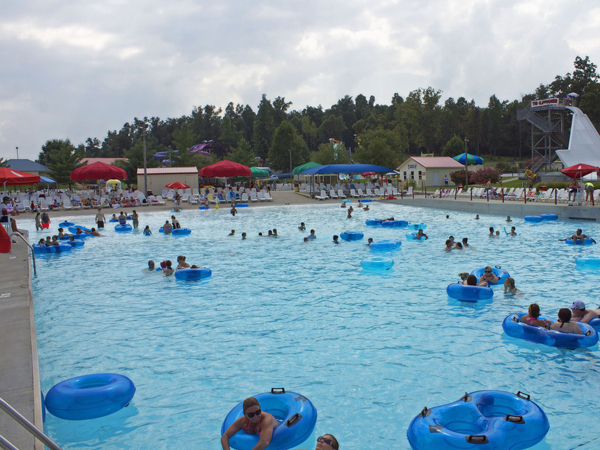 It’s 480,000 gallons of fun and relaxation. Relax in a sea as smooth as glass, until you hear the blast of the Venture River Queen’s Steamboat horn. 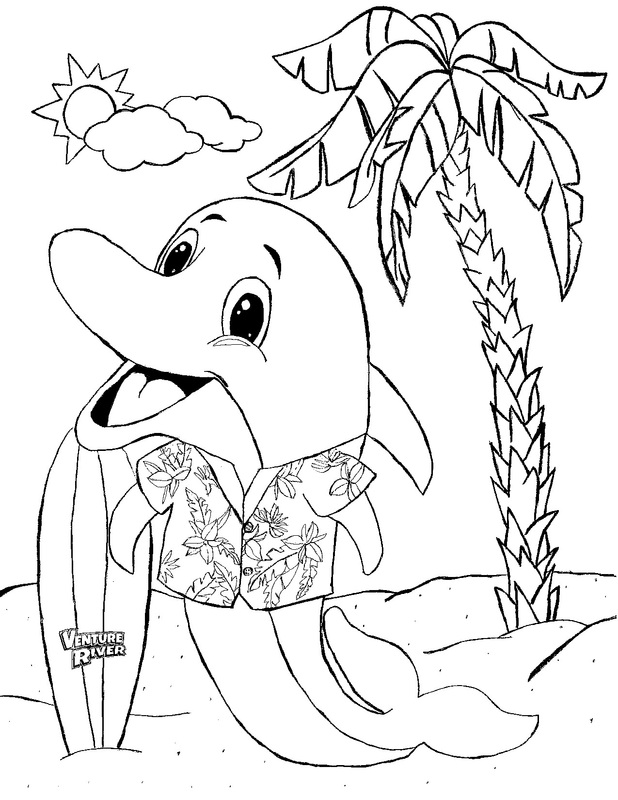 Then you can ride the waves all the way in, or just bob on the breakers. Life jacket suggested for weak or non-swimmers. 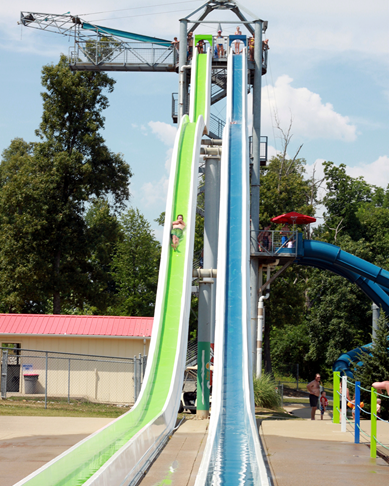 Grab all the thrill seekers who dare to ride down a 3.5 story exhilarating triple dip plunge. Two to Four riders. You must be 48” to ride alone or 44” with an adult. If rest and relaxation are what you’re longing for, then let the peaceful waves of Old Man River massage your tensions away. Float on a single or double tube around an endless river. Tube required. 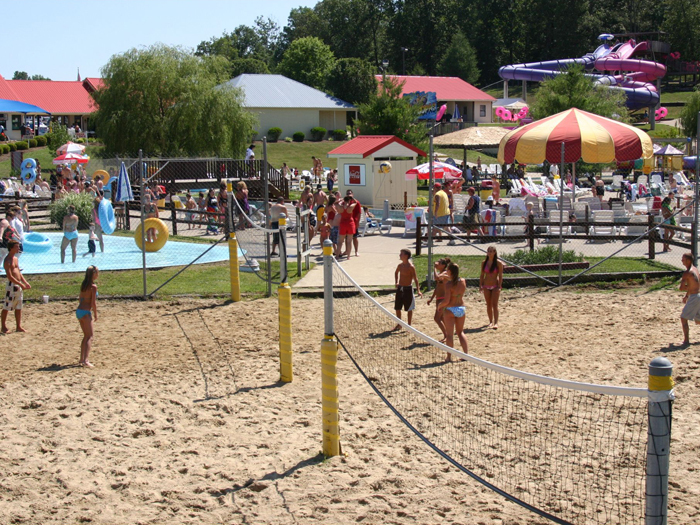 Dry off and continue your exciting day with a game of sand volleyball. The Cliffhanger is for those who are seeking thrills and chills. The excitement starts with a killer 3.5 story drop, then rise to the top of the cliff for another shot BACKWARDS! For the adrenaline seekers grab a friend, because this is a ride you can’t ride alone! This is an extreme ride, you must be 48″ tall to ride the cliffhanger. 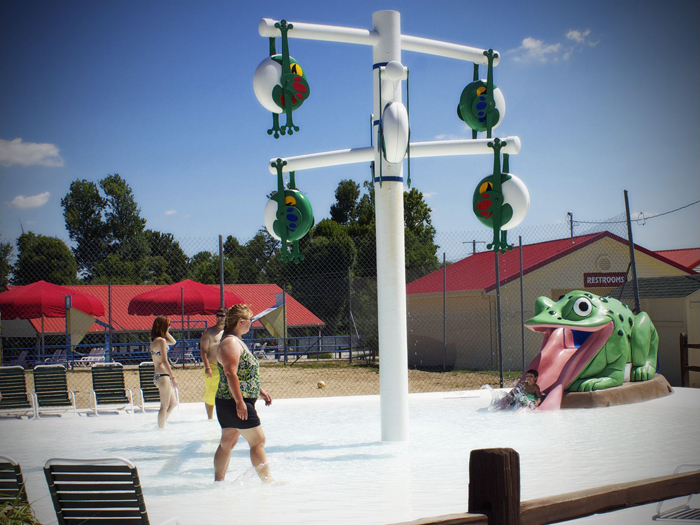 Splish, splash, and wait in anticipation for the hanging frogs to drench you with water. 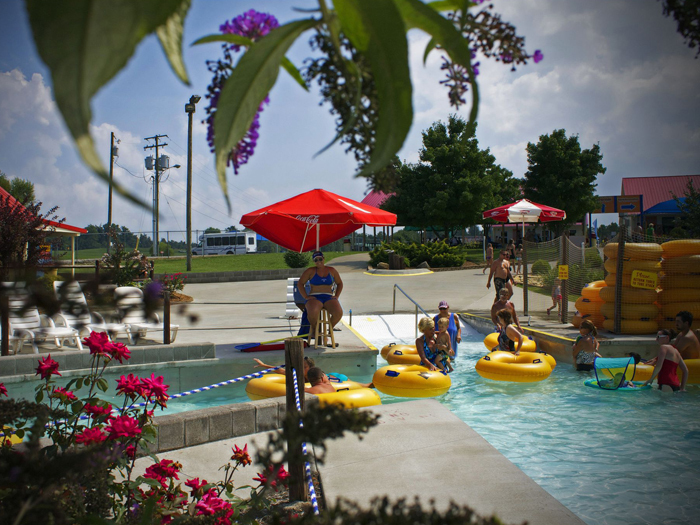 Kids of all ages will enjoy Frog Island and the Frog Slide. Log Walk – Hang on tight and try to cross the lily pads. The pool in this area is approximately one foot deep, and staffed with highly trained life guards. This is a non-smoking area. 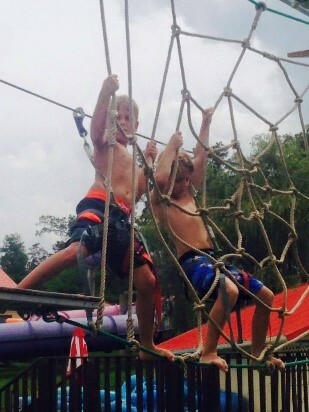 Located on Pleasure Island, the Frog Hop is a challenge course for kids age 4+ and under 56” in height! Kids are harnessed and latched onto a sky adventure. No additional fee. Shoes are required. These tube slides are too much fun for just one! The whole family can enjoy the excitement of the twisting and turning open Twister in our family tubes (up to four people)! 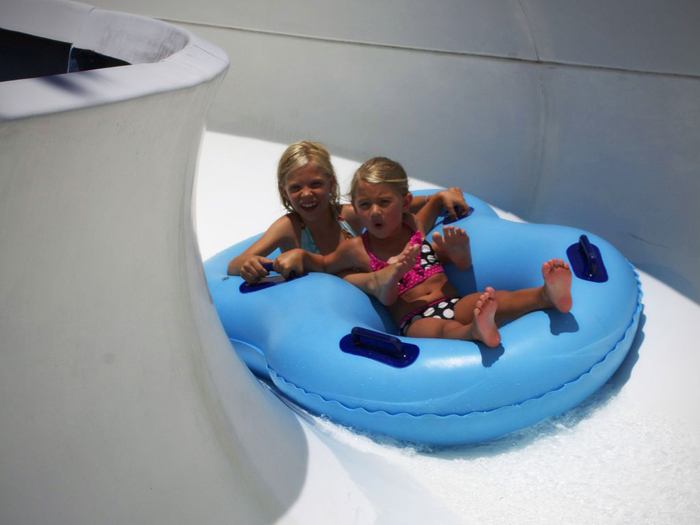 Or grab a friend and hang on as you race down the enclosed Twister on a double tube. Minimum height 36″ to ride alone. Riders under this height may ride with an adult. 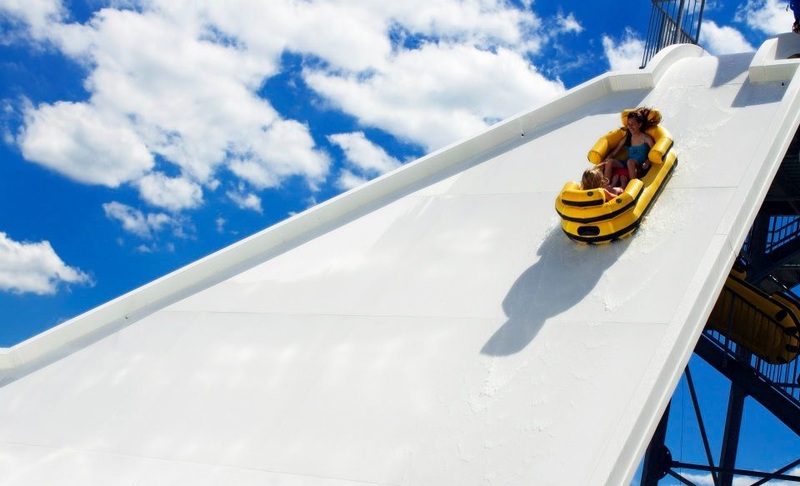 Find adventure in one of the three thrilling, fully enclosed, speed slides. 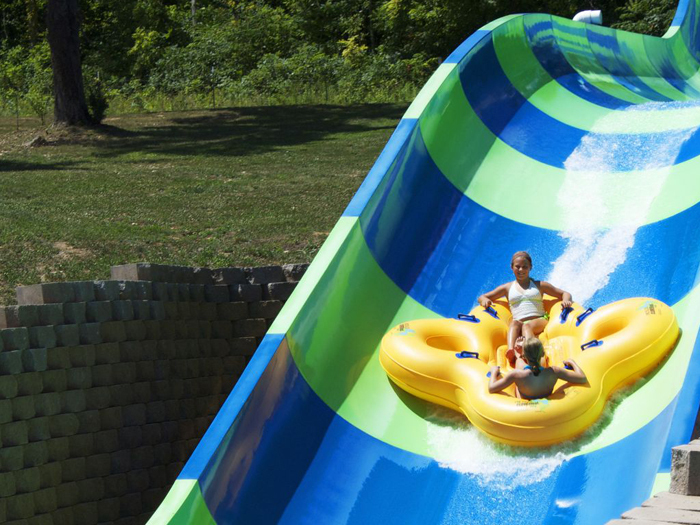 Choose between the high velocity curves of the outer slides or brave the middle slide for a virtually straight down drop all the way to the bottom! It’s so hard to choose, so ride them all – If you dare! 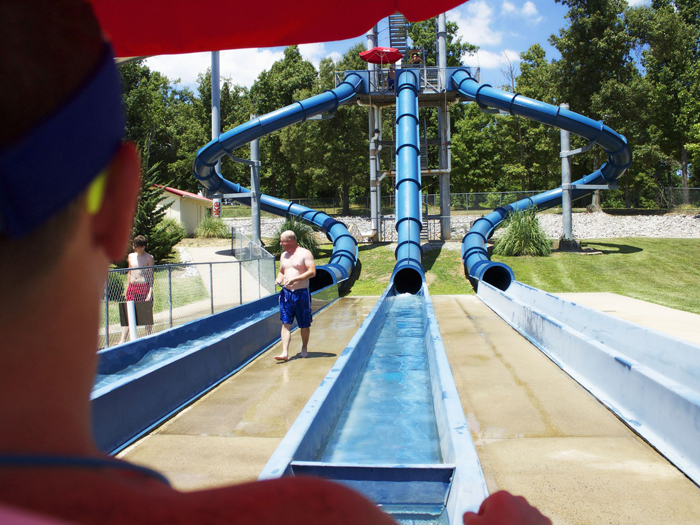 You must be 44″ tall to ride the outer slides, and 60″ tall to ride the middle slide. You have climbed 70 feet into the sky. You enjoy the view while you catch your breath – only to lose it again as you scream down the fastest double-drop speed slide around! This is a great ride to race a friend. 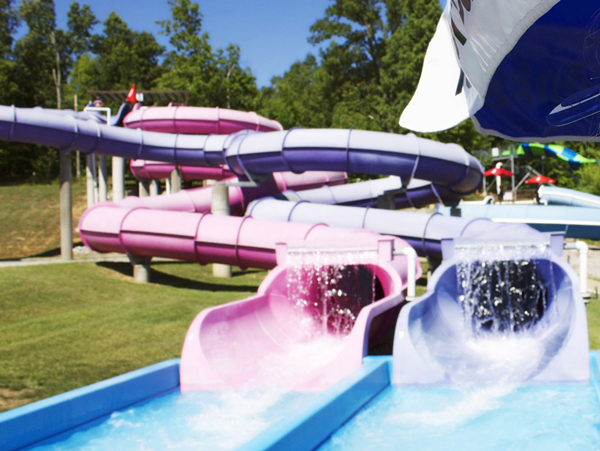 You must be 48″ tall to ride these slides.